Long Island, New York is home to many exquisite places that are exciting to visit with loved ones.There’s nothing quite like Long Island in the summer. There is so much to do and see. From spending a day on the water and having a picnic, to going hiking and enjoying the beautiful landscape Long Island has to offer. 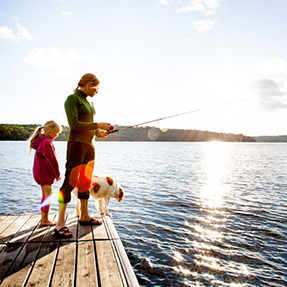 There is no shortage of family-friendly or just friends activities to enjoy in the area. Here are 7 of my fun things to do on our beautiful island. Montauk, originally a little fishing village on the easternmost edge of Long Island, Unlike the Hamptons, where celebrity-spotting and chic ensembles are practically mandatory, Montauk maintains a cool, laid-back vibe that’s perfect for relaxed weekends or longer getaways. Montauk’s natural beauty is unrivaled on the East End. Beautiful, clean, and uncrowded sand can be found. Montauk’s wide ocean beaches rank among the top in the country. Great rolling breakers move in on miles of white gleaming sand. No boardwalks or development here, it’s all natural! Some of the best parks and hiking trails await visitors who come to Montauk to admire the stunning natural beauty. Montauk’s trails are ideal for scenic nature walks, wildlife viewing, botanical enthusiasts, photography and horse-back riding. Many of the trails lead up to a beach, the sound, or lakes and ponds in which you can beach in seclusion, kayak, fish and more. These excursions are not limited just summertime – sightings of the great migration of beautiful Monarch butterflies along the coastal dunes in the Fall will captivate you, and the seal walks in the winter are a thrilling experience. The Montauk Point State Park: It’s not just nature walks and gorgeous views at this wildlife preserve (although when the water is calm, you can see as far as Rhode Island). The easternmost tip of Long Island is also where you can visit the historic Montauk Lighthouse, the state’s oldest, and go surf fishing—no permit necessary. The Montauk Point Lighthouse is a National Historic Landmark perched overlooking the Atlantic Ocean from the top of Turtle Hill, the easternmost point of land on Long Island. The lighthouse is an operational Aid To Navigation and also has a Gift Shop and Museum owned and operated by the Montauk Historical Society. Camp Hero: Is a former U.S. Air Force Military base. History buffs will have a field day here! This park has a pristine maritime forest, natural freshwater wetlands, spectacular ocean vistas and the highest ocean bluffs in Montauk where you can see all the way to Block Island on a clear day. You can get pretty close to the Montauk Radar Tower and the huge buried gun batteries left behind from World War II, which are partially hidden in bunkers. Natural beauty combined with man-made structures of historical interest makes this a very unique hiking experience indeed. Try the Point Woods Loop Trail – unique because it is protected by a natural depression and has seen little recent disturbance from people. The depression and the high bluffs that face the Atlantic Ocean protect the trees and shrubs from being stunted by the salt laden winds blowing off the ocean and bay. This trail hugs the contours of the land and takes the hiker gently up the slopes. Shadmoor State Park: Once used for military surveillance, Shadmoor has amazing hiking trails on 99 acres, with an ocean beach accessed by rolling geography and the almighty shadbush that grows there. High bluffs, freshwater wetlands are also part of the preserve, and elevated platforms are available for bird watching and enjoying the shoreline views. The Preserve Trail is an easy, 2.5 mile hike that will take about 1.25 hours to complete, and is kid and dog-friendly! Hither Woods West: Has over 3,000 acres of diverse oak woods, grass lands, walking dunes and sandy beaches. The Hither Hills West Overlook on Montauk Highway serves as a starting point for more than a dozen hiking trails! These trails are narrow and somewhat rugged, with nature really dominating some areas. Hither Woods is a priceless natural resource, offering hikers and bikers year round access to unspoiled nature. Check out The Ocean View Trail – a seldom traversed, somewhat hilly trail – past Fresh Pond in Hither Woods, finishing on part of the newly created Elisha’s Valley Loop. The Fresh Pond Loop Trail is an easy three mile hike that is also dog-friendly. The Gold Coast is another area of Long Island my love ones and I enjoy traveling too. This is because the Gold Coast stretches from Long Island’s North Shore all the way into Suffolk County, which was once home to some of the wealthiest families in America. In fact, today some of the mansions these wealthy people lived are open to the public for tours and enjoyment. Here you can also explore and visit elegant art galleries, stroll spectacular gardens along the coast and walk along the Long Island Heritage Trail or the Washington Spy Trail. Sands Point Preserve – embodies this legendary era with its historic mansions – Castle Gould, Hempstead House, and Falaise. Built by railroad magnate Jay Gould’s son before being sold to the Guggenheim family in 1917, the estate is now a nonprofit preserve open to the public year-round. Take advantage of all the grounds have to offer: hiking trails, a barn and stables, an outdoor classroom, a rose garden, and access to a mile-long beach. It also hosts family programs, making this an experience the kids can enjoy too. Old Westbury Gardens – The English manor-style mansion built by John Shaffer Phipps in 1906 is still fully furnished with turn-of-the-century pieces and original artwork. The magnificent grounds contain 90 acres of tranquil beauty, consisting of walled gardens, a lake, fountains, a thatched-roof cottage, and numerous picturesque plants and flowers. Old Westbury Gardens also hosts classic car shows, concerts, and horticulture workshops. OHEKA Castle – Currently a full-service hotel, OHEKA was once owned by financier Otto Hermann Kahn. It served as a New York sanitation workers’ retreat and a military academy before being abandoned and falling into disrepair. Purchased by Gary Melius in 1984, the mansion is still being painstakingly restored to its former glory as it hosts weddings and other private events. However, you don’t have to be a guest to get a taste of this grand estate. The hotel has a bar and restaurant offering exceptional cuisine and cocktails. Tours of the mansion and grounds are open to the public as well. Sagamore Hill – “The Summer White House,” Sagamore Hill was the home of Theodore Roosevelt, 26th President of the United States, from 1885 until his death in 1919. During Roosevelt’s time in office, his “Summer White House” was the focus of international attention. After being closed for nearly 3 years in an extensive rehabilitation project, Sagamore Hill re-opens to the public on July 12, 2015. Only structural and restorative renovations were made; the layout and decor are still the same as when the twenty-sixth president walked the halls. The grounds include a museum focusing on Roosevelt’s life, a visitor’s center, apple orchards, and the Sagamore Hill House itself. Shelter Island is the true isolated destination of the Hamptons. The slow ferry ride across the sound is quintessential to the island’s charm, and truly lets you escape the noise and traffic of the Hamptons towns. Head out to Shelter Island before the summer ends, and make sure you check out these can’t miss activities and restaurants! Shelter Island is only accessible via boat, but the ferry trip from mainland Long Island only takes 10 minutes. Two different ferry companies run boats frequently: One ferry leave Greenport every 15 minutes while another ferry leaves Sag Harbor every 10-12 minutes. Shelter Island has a huge bike population. Once you are there rent a bike and head over the thin strip of land to Ram Island where beautiful houses, boats, and restaurants surround the Nature Preserve. Another hot spot for islanders is Dering Harbor. The island is small, so you can cover almost the whole thing in one day. Not only will you enjoy the exercise, but the convenience of everything on the island will make your bike trip even better. Love ones in my family love to go fishing and sailing. At Silly Lily Fishing Station, sailboat rentals are available along with fishing boat and kayak rentals. You can rent a boat to sail the waters of the Atlantic Ocean along the Long Island Coast for up to a Full Day. Summer’s here, time to set sail! A major portion of the summer months in Long Island are spent on the water. There is so much to do and see in Long Island but sometimes you need a new perspective. Boat tours are an excellent way to see all of the beauty of Long Island while enjoying a cruise on the water. Major marinas can be found throughout the Island, with fishing charters and party boats out of Freeport, Captree Boat Basin, Bay Shore, Greenport and Montauk, among others. Marinas, such as Bay Shore, Port Washington, Oyster Bay, Bay Shore, Freeport, West Islip, and Port Jefferson offer other unique boating opportunities for individuals and groups with Riverboat-style party boats, yachts, Long Island dinner cruises and even sloops. For nature-lovers, there are educational wetlands day cruises out of Riverhead and Stony Brook. We’ve got some great boat tours featured here that you and your family will enjoy. The non-profit organization offers a slew of activities ranging from kayak, paddleboards and sailboat rentals, to educational programs, as well as providing coastal access to Oyster Bay Harbor. The WFC is largest community sailing center in New York, and has training programs for adult & junior sailors throughout the spring, summer, and fall. The flagship of the Waterfront Center is the Christeen, a 40 foot gaff rigged oyster sloop. She is now available for harbor tours, sunset cruises, private charters, and educational sails. * Kayak rentals. Available 7 days a week from 8:30 am to 5 pm June through early October. * Parent/Child intro to sailing class for children 8 and up. * Sailboat rentals. 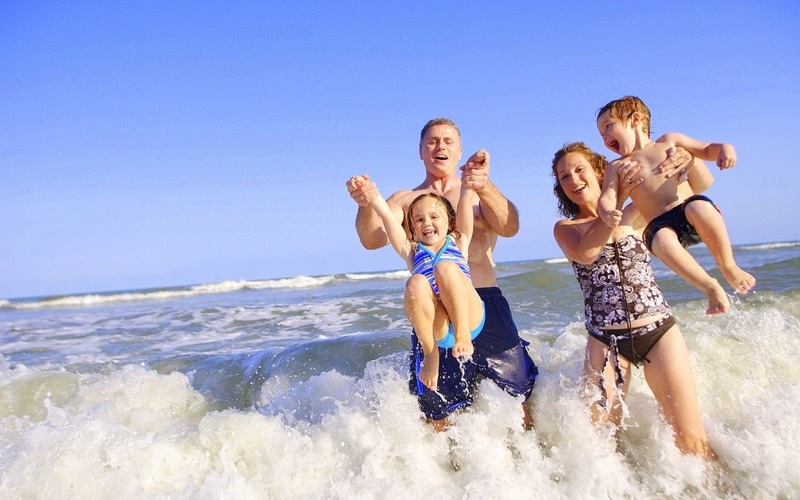 If you are a competent sailor, you can rent a sailboat for the day and set sail with the whole family. If you don’t have sailing certification, you can also rent a boat staffed by a licensed captain for a day. * Public marine education sails on board the Christeen, the oldest oyster sloop in America and a National Historic Landmark. You and your kids will help raise the main sail; steer the boat; dredge for marine life and learn all the creatures that live on the bottom of the bay. Some Saturdays. (See website for dates). 10 a.m. to Noon, $20 per person. * Harbor sails on board the Christeen. A 3-hour sail around lovely Oyster Bay and Cold Spring Harbor shows you wildlife, landmarks and magnificent homes. 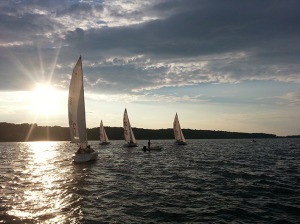 Sunset Cruise - Explore all of Oyster Bay and Cold Spring Harbor aboard the Christeen Oyster Sloop. Built in 1883, it is the oldest oyster sloop in North America. This boat offers a more intimate boat tour holding just 24 passengers. Enjoy the beauty of the Harbor while seeing wildlife in its natural habitat, famous landmarks and more! The Christeen also offers a sunset cruise on Tuesdays and Thursdays. Come see the magnificent “Gold Coast” by water! Long Island Boat Rentals is located in Port Washington at Inspiration Wharf, next to Louie’s Oyster Bar & Grill. Whether it is for swimming, tubing or fishing, they offer a variety of power boat rental sizes to meet your needs, including the 20’ Sea Hunt Dual Console (7 person capacity), the 21’ Sailfish Center Console (8 person capacity), to the brand new 24’Sea Ray Sundeck Outboard (10 person capacity). Rental boats are available 7 days a week. Training programs are available for new boaters, or for convenience you can hire a captain to pilot the rental. While the captained charters can be taken to the destination of your choice, the boating area for rentals stretches from the Throg’s Neck Bridge to Huntington Bay and Norwalk Harbor, and all of the attractions in between. 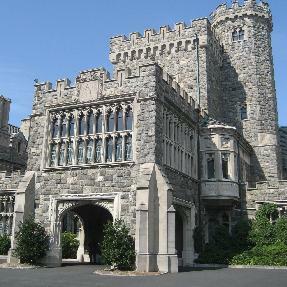 Sites include spectacular close up views of many of the Gold Coast mansions and other historic buildings as well as waterfront access to restaurants and beaches along the Long Island and Connecticut shores. Around your boating excursion, Port Washington itself is a great destination, with attractive restaurants, shopping and museums, making for a fun day for the family both on water and on land. If you would like to fish on an open boat, the Laura Lee is my favorite boat out of Captree. It sails 3x daily during the summer months. Boat is always clean inside and also bathrooms. 2 bathrooms for the ladies and the gentlemen. The captain and crew are great. Always willing to take care of everyone’s needs. From setting up your rigs to taking the fish off the hook for you. They are always pleasant and friendly. I made many fishing buddies on this boat. Just don’t forget to take care of the mates as they work mainly on tips. I think 20% is customary, just in case people did not know. They will also filet your fish for that tip also. So bring lunch, snack, and some beverages and enjoy a day out fishing. Rod and reel, & all bait and tackle are included. Those love ones who enjoy golfing, it is a must to check out the Bethpage State Park. In the early 1930s, the Bethpage Park Authority purchased the Lenox Hills Country Club and other adjacent properties to build what we now know as Bethpage State Park. 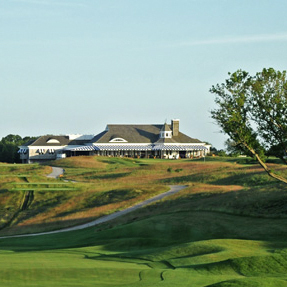 Bethpage State Park is best known for its five world-class 18-hole regulation golf courses, including the world-renowned Black Course which was the site of the U.S. Open Championship in 2002 and 2009. Visitors also flock to the park to use the park’s picnic facilities, playing fields, tennis courts, bridle paths, hiking and biking trails and cross-country skiing trails. 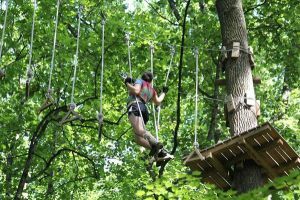 Located in Wheatley Heights, NY on five spectacular wooded acres of the Henry Kaufman Campgrounds, The Adventure Park at Long Island is the area’s most exciting new attraction. The Adventure Park appeals to outdoor fun-seekers age 7 through adult and features multiple zip lines and aerial ropes challenge courses. 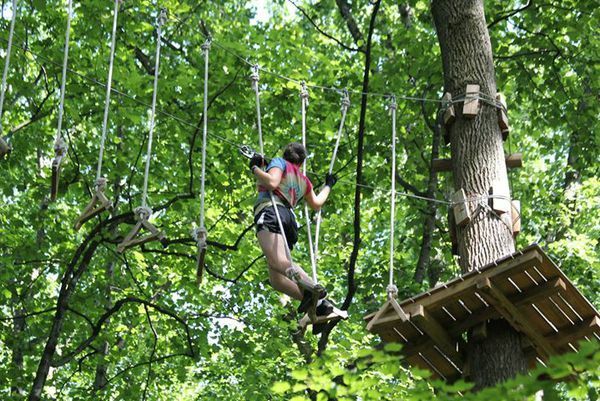 The Adventure Park at Long Island consists of ten different “ropes courses” or trails through the trees, of varying challenge levels, from introductory to advanced. The self-guided trails do not require previous climbing experience. After receiving a safety briefing and harness, each climber selects a trail at their comfort level and then proceeds to navigate its different “bridges” or “elements” moving from tree platform to tree platform. The trails include zip lines as well. Climbers proceed at their own pace and each trail requires anywhere from approximately 15 – 30 minutes to complete. 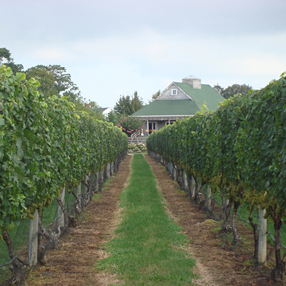 Located on the North Fork of Long Island, Corey Creek Vineyards is a gorgeous wine vineyard located on Long Island in Southold, NY. It offers wine tasting in its elegant wine tasting room and fine handmade wines for sale in their beautiful airy old barn style gift shop with large glass doors that open up to a large porch area that over looks the vineyard. Each wine you tasted and purchase here come directly from the grapes the vineyard grows and harvests themselves.